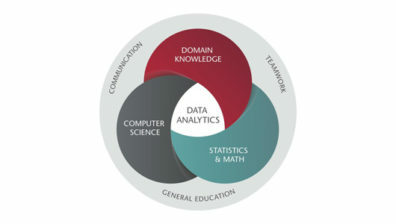 The WSU data analytics core curriculum and specialization tracks develop strong technical skills and working knowledge of an application area, combined with strong communication skills and the ability to work in teams. In addition to strong data analytics skills, our students will develop domain knowledge that will enhance their ability to translate raw data into appropriate industry applications. Each specialization track provides students with opportunities to expand their communications skills and work in team to achieve goals. Credit requirements vary for each track. All WSU undergraduates must satisfy the University Core Requirements [UCORE] in order to graduate. Some courses within the data analytics curriculum may also satisfy UCORE requirements. Details and a list of UCORE course options are available at the Undergraduate Graduate Requirements website.